Long before Bella Swan, Sookie Stackhouse, or Blade, in the days before we realised Tom Cruise doesn't suit a frock-coat, that Swedish horror is surprisingly good, and before we knew to be cautious of clockwork beetles; there was Buffy. Buffy The Vampire Slayer, the 1992 film, is a huge amount of big old hammy fun. Buffy (Kristy Swanson) is a popular high school cheerleader, leading an ordinary valley-girl life, until she meets Merrick (Donald Sutherland), her “Watcher”. He informs her that she is “The Slayer”, whose destiny it is to save the world from vampires, and she spends the rest of the film battling both with the undead and with her new identity. The film stars Donald Sutherland, Rutger Hauer, David Arquette, Luke Perry (at the height of his 90210 fame) and, a scene-stealing Paul Reubens. And, it’s fun to play “before they were famous”--Hilary Swank appears as one of Buffy’s cliquey friends and Ben Affleck pops up briefly during a basketball game. The movie, although based on the same premise as the TV series that screenwriter Joss Whedon later went on to create, is a fairly different creature. He has since stated that the film was “a disappointment” and actually left the set before shooting finished. So, as a huge Joss Whedon fan, I feel a little guilty for loving it so much. However, although director Fran Rubel Kuzui had a “different vision” for the film, Whedon still went on to use her as the Executive Producer of both the Buffy and Angel TV series. Buffy is a fabulous mix of genres: high-school drama, horror, comedy and action movie all in one. 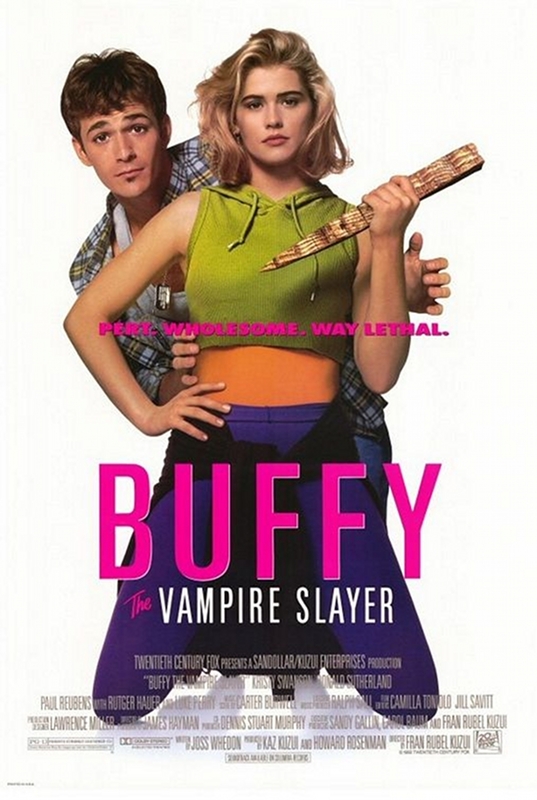 And Whedon, who identifies himself as a feminist, has done a great job of subverting the established silver screen gender roles--it is Pike (Luke Perry) who has to be rescued on several occasions as Buffy struggles to accept her calling –- ultimately creating a tale of female empowerment. There are lines in this film that make me laugh out loud. Characters like Buffy’s disinterested parents, her cliquey friends and the emotionally-intelligent basketball coach provide plenty of memorable lines, and Paul Reuben’s improvised death scene is just a joy. And that’s where I’d like to leave this, a tribute to a good, fun film that told a solid story and made me laugh. But, in 2010, Warner Bros announced their plans to release a new Buffy film -- without Joss Whedon’s involvement. Depressing on so many levels, one can only assume they want to cash in on the current vampire vogue and get a piece of that Twilight action. One can only wish that Warner Bros would learn to let the undead stay undead…if you know what I mean.